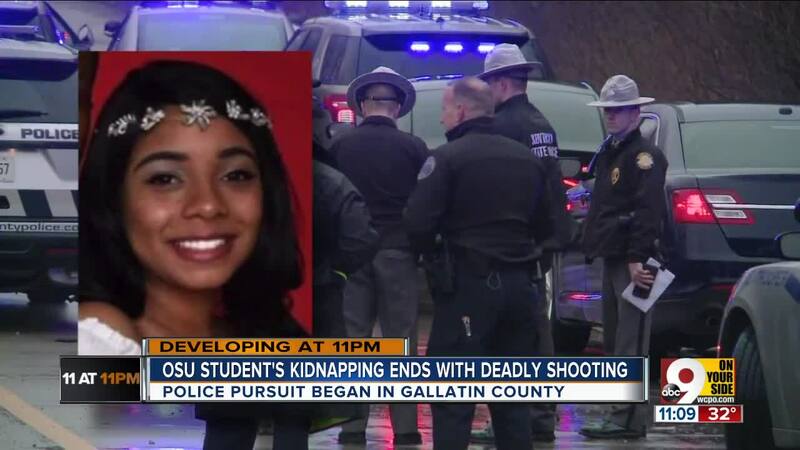 An Ohio State University student and a man who authorities said abducted her are dead following a police chase in Kentucky, according to Kentucky State Police. 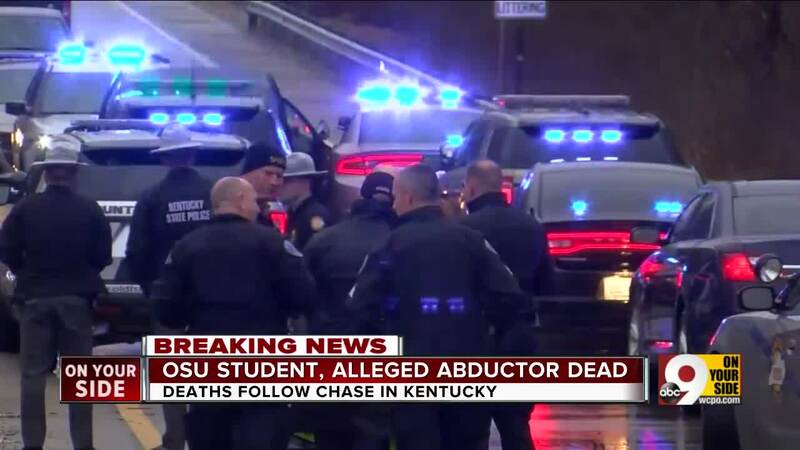 CRESTWOOD, Ky. — An Ohio State University student and a man who authorities said abducted her died after a police chase in Kentucky, according to Kentucky State Police. Authorities said 24-year-old Ty'rell Pounds forced 20-year-old Skylar Williams into a vehicle at gunpoint in a parking lot on OSU's Mansfield campus Monday morning. Williams and Pounds had a child together, according to the Ohio State Highway Patrol. A police report indicated they were going through custody issues. The child was safe with family when the abduction occurred, Ohio troopers said. Williams filed a protection order against Pounds after she said he tried to pull her into his vehicle at a gas station last month, and reported that he had raped her in September, according to police reports obtained by ABC News. Monday afternoon, a 911 caller in Gallatin County, Kentucky reported seeing a distressed woman asking for help at a gas station forced her into a minivan. They sped off into southbound Interstate 75. Kentucky troopers spotted the minivan in Henry County and attempted to pull the driver over, but the driver didn't stop, according to Kentucky State Police. The pursuit continued into Oldham County, where troopers used stop sticks, but the driver evaded them. The driver exited I-71, crossed Highway 329 and attempted to reenter the interstate, Kentucky State Police said. Troopers then blocked the minivan to stop it from getting back on the interstate. A trooper then approached the stopped vehicle to arrest the driver, but heard a gunshot. Kentucky State Police said the trooper fired his service weapon and hit Pounds, killing him. Williams was also hit by at least one round of gunfire, Kentucky State Police said. It wasn't immediately clear whether Pounds or the deputy fired that round. She was driven to University of Louisville Hospital, where she was pronounced dead. Pounds was pronounced dead at the scene. Ohio State University President Michael Drake called Williams' death "a tragic loss." He said additional counseling services are available on OSU's Mansfield campus. "This senseless and shocking incident has left our campus shaken," Drake said in a written statement. "We join Mansfield Dean Norman Jones in expressing our condolences and deepest sympathies. Our thoughts and prayers are with Skylar's family."